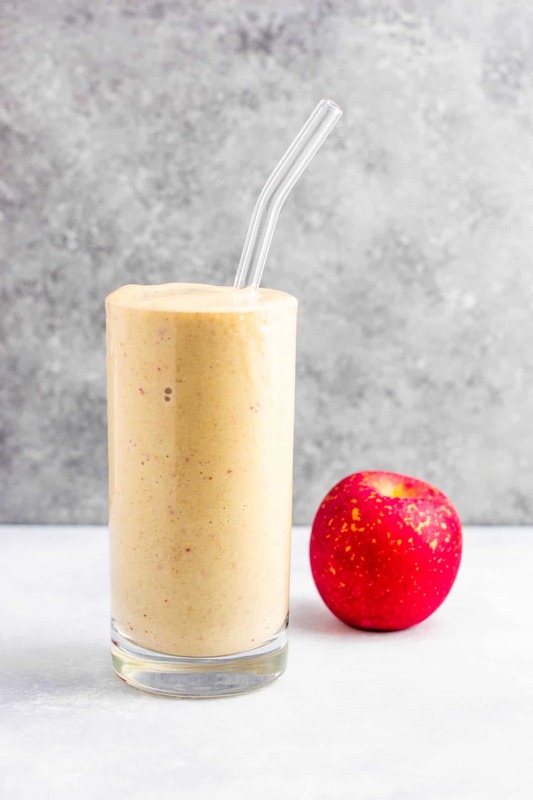 This healthy apple pie smoothie tastes like dessert and is full of nutritious ingredients! Now that it’s October, I’m loving making all of my smoothie fall themed. Smoothies are a year round treat for me, just like I drink iced coffee any time of year. 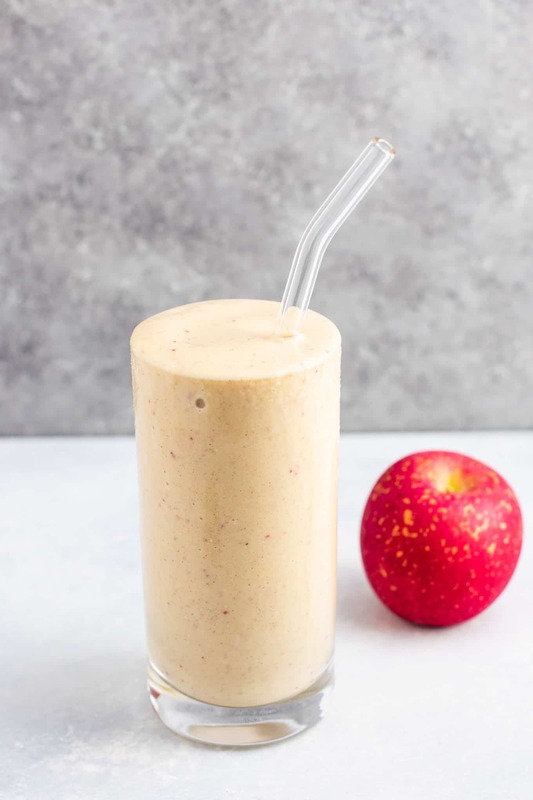 From sweet potato smoothies to frozen pumpkin pie smoothies, to this delicious apple pie smoothie. I love making things that taste like fall in a glass but are also good for me! One of my favorite fall desserts is vegan apple crisp. 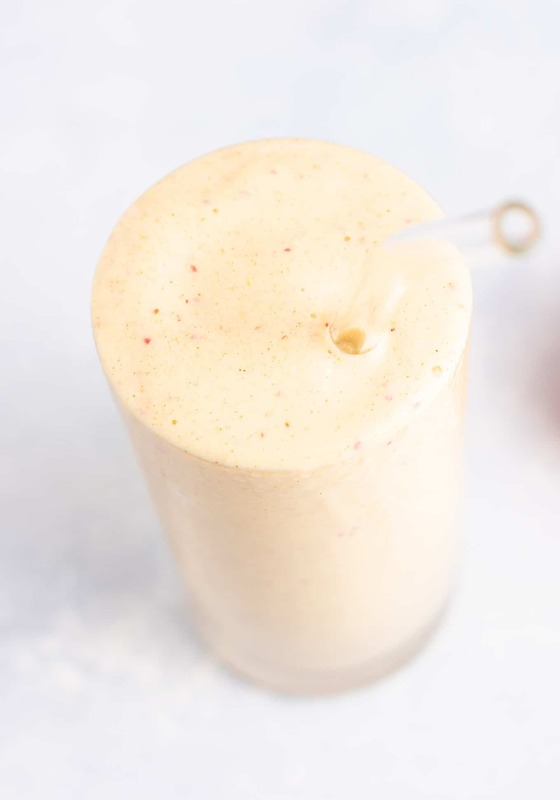 I made this smoothie to taste like an apple pie treat! 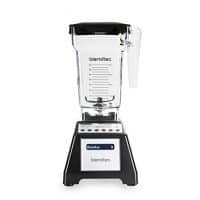 Adding the milk first will help the blender blend more easily. Core two apples and place them in the blender. Apple seeds can be toxic, so be sure not to put the apples in whole. 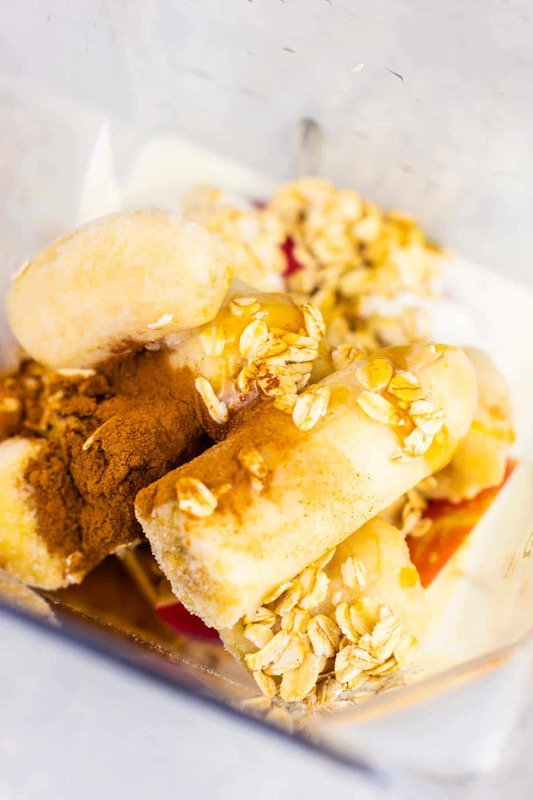 Add frozen bananas, greek yogurt, cinnamon, honey, rolled oats, and almond butter to the blender. I love the slight nuttiness that the almond butter gives, and it really pulls all the flavors together. Place lid on and blend until thick and creamy! If you have ever tried a Build Your Bite smoothie recipe, you’ll know that they are usually very thick. I personally prefer my smoothies to have that super thick ice cream like texture – they taste so much better that way! The best way to drink them in my opinion is with a reusable glass straw (I bought mine on Amazon). I seriously feel like I’m indulging in a milkshake treat! I use frozen bananas in a lot of my smoothie recipes to get that super thick ice cream like creaminess. Once a bunch of bananas is very ripe, simply peel and break them into chunks. Place in a freezer safe ziploc bag in the freezer until ready to use. I find this much easier than freezing bananas whole, as the chunks are easier on a blender. I always have frozen bananas on hand! They are also great for making homemade chocolate banana ice cream! Are you making this recipe? I want to see! Be sure to tag us on instagram @buildyourbite and hashtag #buildyourbite with your recipe photos! Looking for more healthy smoothies? Try these delicious recipes! Be sure to follow Build Your Bite for all the latest delicious vegan and vegetarian recipes! 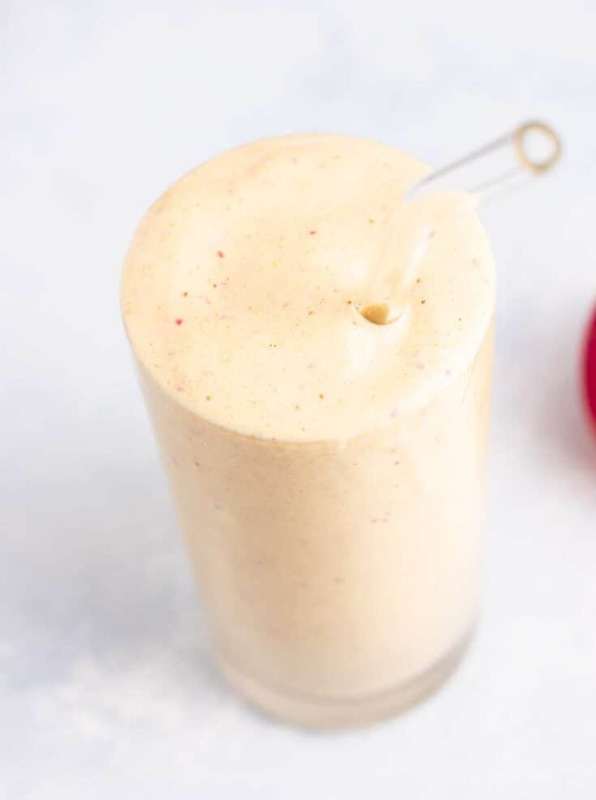 Easy, healthy apple pie smoothie recipe (gluten free). A delicious smoothie that tastes like a fall treat!